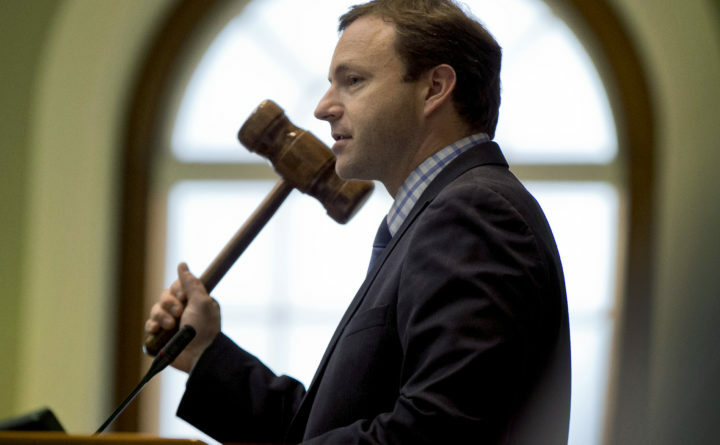 House Speaker Mark Eves presides over budget discussions at the State House in Augusta, Maine. A federal appeals court is set to hear arguments Tuesday, April 3, 2018, in Boston in a lawsuit filed by Eves accusing Republican Maine Gov. Paul LePage of abuse of power and blackmail. A lawyer for Republican Maine Gov. Paul LePage has urged a federal appeals court to toss a Democrat’s lawsuit accusing him of blackmail. Attorney Patrick Strawbridge told the 1st U.S. Circuit Court of Appeals in Boston on Tuesday that the governor is immune from the legal challenge brought by former House Speaker Mark Eves. Eves says the governor overstepped his authority when he threatened to withhold state funding to force Good Will-Hinckley, a charter school operator in Fairfield, to rescind a job offer to Eves in 2015. Eves had signed an employment contract with the organization, but it was rescinded after LePage publicly criticized the choice and threatened to withhold more than $1 million in state funding if the school went through with hiring Eves. Eves, who is a Democratic candidate for governor, said after the hearing that the court must set a precedent to prevent something like this from happening again. The legal battle has been playing out since 2016. Eves’ suit was rejected in court last year but revived in January of this year by the appeals court. The court granted what is known as an en banc hearing, meaning the court’s previous ruling will be vacated and its full panel of appeals judges will consider the matter, as opposed to a select panel of judges who made the earlier ruling. It’s unclear how long deliberations in the matter will take.